The NEW ImageXpress® Micro 4 High-Content Imaging System based on an inverted widefield microscope offers an agile solution allowing to boost research while providing the option to upgrade to confocal in the future. Unlimited configurability with user exchangeable filter cubes, the widest range of objective lenses and environmental control, transmitted light, confocal imaging, and fluidics options are part of the system. Built on over 30 years of cell-based imaging experience, the ImageXpress Micro 4 High-Content Imaging system is engineered for performance to reliably accelerate the pace of research. Supported by MetaXpress® High-Content Image Acquisition and Analysis Software, the ImageXpress system provides a fast and robust platform to translate new discoveries into scientific breakthroughs. Faster-than-ever, agile system, which grows with needs. 4th Generation Platform with unlimited configurability, developed to address your research needs. The automated 5-position filter cube changer facilitates multiplex assays with up to five filter sets and four objectives for a single experiment. Minimize tiling effect and reduce acquisition time with the ability to image a whole 384 well at once. 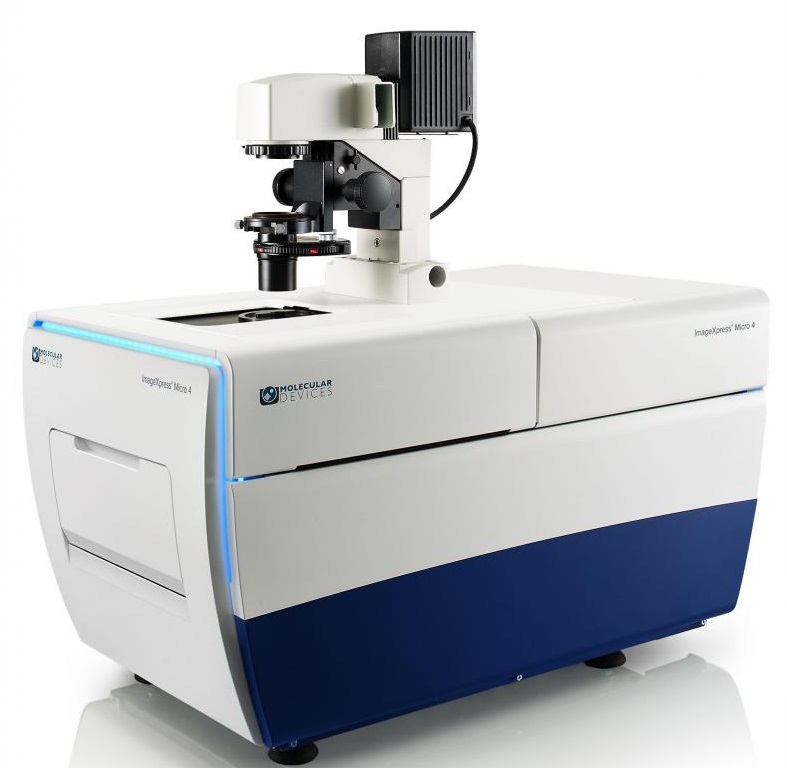 Available options include Environmental Control (temperature, humidity and CO2 control for multi-day live-cell experiments), Transmitted Light True Phase Contrast, Confocal Imaging (field upgradable), and Fluidics (on board disposable pipetting).